The Hubble Space Telescope is an icon in space that has peered deep into the universe for 25 years. 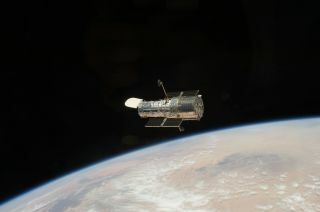 In May 2009, astronauts on NASA's space shuttle Atlantis captured this farewell photo of Hubble near the end of the final servicing mission to the telescope. Scientists working with the long-lived Hubble Space Telescope say that the intrepid eye on the sky could continue functioning through 2020, and even beyond. Hubble is currently in good shape. The instruments repaired during the last Hubble servicing mission in 2009 have operated longer since the repairs than they did with the original hardware, Kenneth Sembach of the Space Telescope Science Institute said during a news conference in January at the 225th meeting of the American Astronomical Society. Operating the telescope through 2020 is an important goal for NASA. Hubble's successor — NASA's James Webb Space Telescope (JWST) — should launch in 2018, creating a one-two punch of space telescope observations for at least a couple years before Hubble's mission ends. And officials are doing all they can to be sure that the spacecraft keeps working through at least that target date. NASA astronaut Michael Good salutes during a spacewalk to upgrade the Hubble Space Telescope on May 15, 2009 during the space-based observatory's final servicing mission, STS-125. "We're conducting what we're calling the '2020 vision' for Hubble, and that is to make sure that the observatory is ready to run for at least five or six years to get at least a year of overlap with James Webb, if not more," Sembach said. "We're lucky in that we have very proactive engineering that's been going on over the last few years and continues to go on both at the [Space Telescope Science] Institute and at [NASA's] Goddard [Space Flight Center] to make sure that we're operating the observatory as safely and as effectively as we can. So, we're going to get to 2020." JWST and Hubble are designed to observe somewhat different cosmic spectacles. JWST will extend Hubble's reach into the early universe, allowing scientists to potentially learn more about how the earliest galaxies formed. If the two telescopes do function simultaneously, scientists might be able to observe one target using both observatories, giving researchers a more detailed spectrum of science from the cosmic target. "The Hubble Space Telescope mission office and the James Webb Space Telescope mission office are discussing ways that we can allow people that have excellent science ideas that require both facilities to take data of the same targets to get those data sets on both missions," Jason Kalirai of the Space Telescope Science Institute said during the news conference. "We're in the process of putting together policies that are going to ensure that's possible."